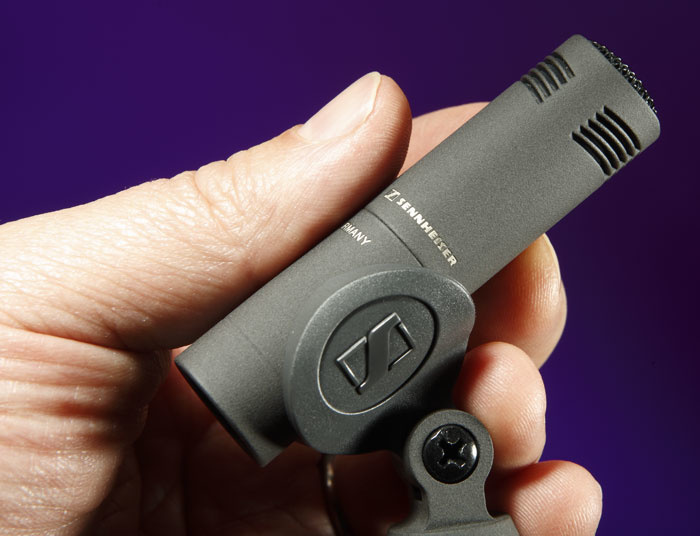 Sennheiser have taken advantage of new technology to produce a smaller, lower-cost modular version of their modern classic MKH range of microphones. Photo: Mike CameronDespite the widely held view that condenser (capacitor) microphone development stopped 50 years ago, Sennheiser's MKH range is one of many examples showing that this simply isn't the case. Others include the development of very high-quality back electrets such as DPA's small-diaphragm mics, and AKG's large-diaphragm models such as the C3000, C4000 and new C214. Work on rectangular and other non-round capsules from Pearl and others, as well as multi-capsule designs, has also proved beneficial. Returning to Sennheiser's contribution, the reputation held by the MKH mics for clarity and precision is thanks largely to two innovative technologies: RF capsule biasing (1961) and symmetrical capsules (1985). The box elsewhere in this article explains these technologies, in case you are unfamiliar with them. The original MKH models that launched the RF capacitor microphone concept were largely superseded when the symmetrical capsule was introduced in 1985 — bringing us the MKH20 omni, MKH30 figure-of-eight, MKH40 cardioid, MKH50 hypercardioid, and two interference tube (shotgun or rifle) mics, the MKH60 and 70. There was also the switchable multi-pattern MKH80, which was later superseded by the wider-bandwidth MKH800. This comprehensive range has been left untouched for over 20 years now — essentially because nothing has bettered their technical specifications and they have consistently remained very popular. So why introduce new models now? Two reasons: firstly, the increasing demand for ever-smaller and more discreet mics (largely driven by HDTV), and secondly the fact that surface-mount technology now allows that step to be taken without compromising the quality in comparison with the existing MKH range. Hence the launch of the new 8000 series — a complete ground-up redesign, which has been based on exactly the same capsules but uses them in considerably more compact bodies. To maximise the flexibility of these new miniature capsules, Sennheiser have produced a range of interchangeable modular accessories, such as swivel joints, extension tubes and cables. For this review, I was supplied with a stereo set of matched MKH8040 cardioids. At the time of writing there are also 8020 (omni) and 8050 (supercardioid) capsules available, and the range will expand further over the coming months. The stereo kit is contained in a lockable aluminium case, housing a matched pair of 8040 mics together with foam windshields and simple stand-mount clips (complete with 3/8 to 5/8-inch thread adaptors). The microphones are finished in a dark-grey Nextel coating to prevent visual reflections and help make these miniature capsules even harder to spot — in real life or on TV. The complete MKH8040 microphone as supplied in the case measures 75mm long by 19mm in diameter, and weighs 55 grams. However, this microphone is actually two modules screwed together: the 'active' MKH8040 microphone itself, and the MZX8000 connector section that provides the XLR interface. The microphone element comprises the symmetrical capsule, all the miniaturised RF electronics and a balanced output driver, and it measures just 41mm long and weighs 25g. The connecting screw thread at the base of the module is pretty fine, but mating the mic and XLR module together is very precise and positive, so I don't think there's any risk of cross-threading. A traditional 'AF' condenser mic capsule is charged with a DC polarising voltage, typically 60 volts or so, but sometimes more. As passing sound-waves move the diaphragm, the amount of charge stored in the capsule varies proportionally, and a tiny output current is generated. To prevent the stored charge from leaking away, a very high-impedance buffer circuit using a valve or FET (Field Effect Transistor) is necessary. Sennheiser's 'RF' design uses the same mic capsule, but in a very different way. An oscillator generates an 'RF carrier' signal at about 8MHz, and this signal is amplitude-modulated in response to sound by the capsule's varying capacitance. A demodulator then extracts the audio signal and outputs it. Although this involves more complex circuitry than the traditional approach, the capsule then operates in a very low-impedance environment, making it much less susceptible to atmospheric humidity and dirt on the diaphragm, which tend to cause rumbles, crackles and splats in 'AF' mics. The RF design also enjoys lower self-noise than a valve or FET impedance converter, accommodates a wider dynamic range, and has a more extended LF response than conventional small-diaphragm capacitor mics. Most condenser mic capsules comprise a lightweight diaphragm in front of a fixed metal backplate. However, since one side of the diaphragm is open to the outside world and the other is enclosed, there are different acoustic impedances on either side — and the diaphragm can move more easily outwards than it can inwards. This results in intermodulation distortion. Sennheiser's symmetrical capsule design places the diaphragm between two acoustically transparent 'backplates', to create symmetrical acoustic impedances on either side. It is a more complex and expensive design, but the benefit is much lower intermodulation distortion than single-plate designs, plus higher output and lower noise. The result is a noticeably cleaner and more accurate sound — although some people miss the subtle distortions of more conventional mics, which provide a familiar 'analogue' quality. Although Sennheiser refer to their new 8000 series as 'modular,' I think it is important to make clear that this is not in the same sense that Schoeps describe their Colette modular range or, indeed, Neumann's KM100 range or even Sennheiser's own K6 range. In all of these the capsule is just that — a traditional microphone capsule — and it must be connected to a separate 'head amp' module, via extension tubes or cables, as required. This configurable modularity enables the user to acquire a number of different (and relatively cheap) capsules, and use them as necessary with a smaller number of (relatively expensive) head amps, providing maximum flexibility at minimum cost. The MKH8040 stereo set is supplied with stand-mounts and foam windshields in a sturdy carry case.Photo: Mike CameronBy contrast, the 'capsules' in the MKH8000 range are actually complete microphones, as I have described, and the system's modularity is simply in the way the 'capsule' connects to the outside world. Since the capsule is now the expensive bit, this has a big influence on the pricing structure and, as a result, the 8000 series may appear expensive in comparison to other 'true' modular systems. On the plus side, a complete 8000-series mic is about 35 percent cheaper than its larger MKH equivalent, which will appeal to anyone hankering after the MKH sound but without the budget! Reconfiguring the 8000-series elements is as simple as unscrewing the active microphone capsule from the supplied XLR connector, and then inserting the appropriate cable or extension tube between them. At the time of writing there are two remote cables (three and 10 metres) and four extension tubes (from 15 to 120cm), as well as various purpose-designed desk stands and other mounting accessories including a swivel joint (or knuckle). A digital output module, the MDZ8000, will also shortly be made available, and this will fit in place of the standard XLR module to provide A-D conversion and an AES42-formatted digital output (24-bit word-length and up to 192kHz sample rate). The technical specifications for the new 8040 differ slightly from its MKH40 forebear. For example, the frequency response of the new model is claimed to extend between 35Hz and 50kHz, whereas the older, larger model ranges from 40Hz to 20kHz. The 8040's sensitivity is also 2dB less than the MKH40, at 20mV/Pa, and the self-noise is 1dB higher, at 13dBA, but the maximum SPL has been increased, usefully, to 142dB (for one percent distortion). It is worth noting, though, that the MKH40 is equipped with both a 10dB pad switch and a bass-cut filter, neither of which is available on the 8040. The 8040's polar pattern is well controlled, being a near-perfect cardioid up to 4kHz or so. Above that it develops a small rear tail and narrows across the front. Neither are unusual, but the MKH40's published polar response is a little tidier at the high end. Turning to the frequency response, the quality-control plots for MKH40s always looked like they had been drawn with a ruler! In contrast, the 8040 exhibits a gentle 2dB presence lift extending between about 5kHz and 20kHz, and there is roughly 1dB of 'bass bloom' from 400Hz down to about 60Hz. Below that, the bass roll-off is very smooth, at only about 3dB per octave. The technical precision of the standard MKH range, and the virtual absence of intermodulation distortion, isn't to everyone's taste; many prefer their mics to have more character. But for those who like the clinical MKH sound — and I do — the 8000 series certainly has a lot to live up to. In direct comparisons with a pair of my own MKH40s, I felt that the top end of the new models sounded a little more open and airy, while the bottom end was fractionally warmer. These differences are subtle, but they will probably help the 8000 series appeal to those who felt the original mics were a little too cold and precise. Thankfully, though, this subtle re-voicing doesn't detract from the inherent clarity and precision of the MKH design, which remains its key strength. I use my own MKH mics (20s, 30s and 40s) for a wide range of duties, including orchestral spots, ORTF and crossed pairs on choirs, brass bands... and pretty much everything in between! I have even used them for pop vocals, where the transparency and very low self-noise provided a useful alternative to the more traditional large-diaphragm approach. Experimenting with the new MKH8040s I soon discovered that they proved equally multi-faceted, and very capable performers indeed. Although I initially rigged them with my larger MKH mics alongside as backups, I quickly lost any qualms about using them for all the same applications. Indeed, I actually preferred the 8040 on a solo cello recording, and I only heard positive comments from my colleagues about the sound of these new mics. For those seeking ultimate flexibility in combining a variety of different capsules with a smaller number of mic bodies, the MKH8000 range is clearly not the most cost-effective solution. However, where the classic MKH sonic virtues are desirable in a flexible and very compact form, the 8000 series is exactly what we have long been waiting for. The modest re-voicing gives a subtly enhanced character that will win it more friends, too, and the digital interface option will be a particularly enticing option. I'm in no doubt that Sennheiser have a winner here, and hopefully the pricing will encourage more people to discover the world of Sennheiser's symmetrical-capsule, RF capacitor mics. There is no alternative to this system from a technical point of view, since nobody else produces symmetrical capsules, and only Sennheiser (and now Rode) use the RF principle. In terms of other modular systems, Sennheiser's own K6 range is popular as a mid-range offering. 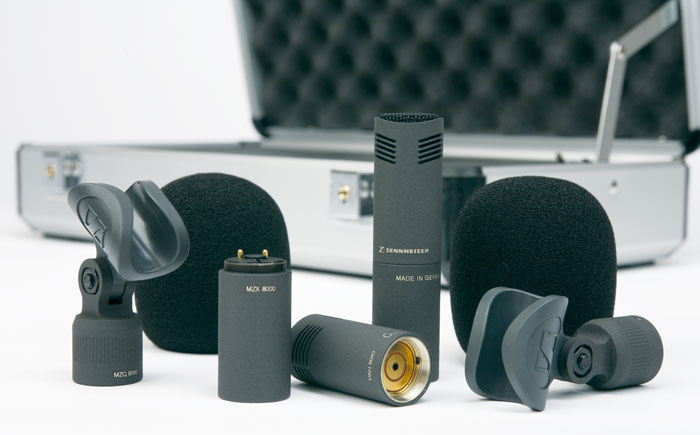 High-end alternatives include the KM100 series from Neumann and the Schoeps CMC range. The benefits of capsule symmetry and RF operation have been retained. Provides a warmer and less clinical character than the original MKH mics. Modularity provides very neat mounting options and flexibility. AES42 digital interface on the way. Cheaper package than full-size equivalent MKH models. Active capsules are expensive compared to other passive designs. A compact version of the MKH range of microphones, with the added advantage of modular accessories. MKH8040 £875.38 (includes mic module, XLR module, stand clip and foam windshield); MKH8040 stereo set £1639.13; MKHC 8040 (mic head only) £699.13. Prices include VAT. Sennheiser (UK) +44 (0)1494 551551.